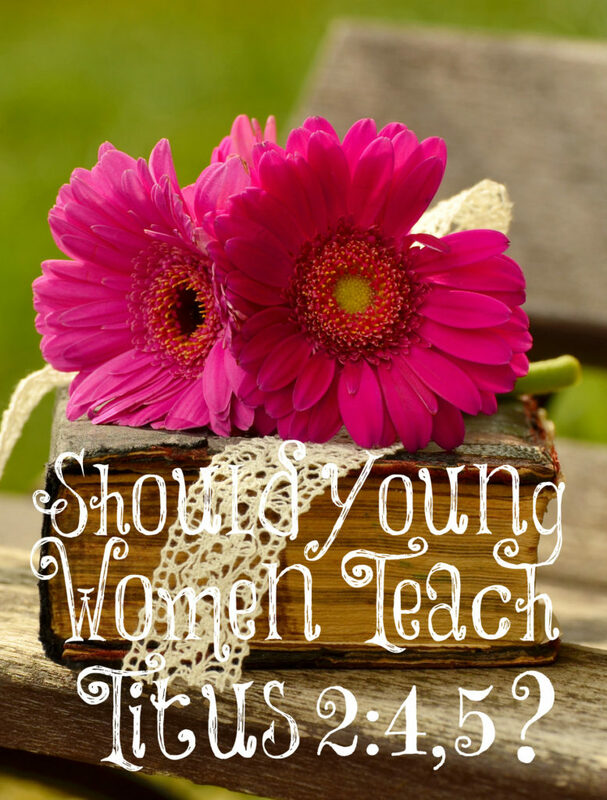 Should Young Women Teach Titus 2:4, 5? As many of you have noticed, there are a lot of younger women teaching other women the precepts of Titus 2:4, 5. It is most likely due to the void left by older women who are not obeying the Lord in this area. But are they the ones that should be teaching these things according to the Word? We know that younger women should love and obey their husbands, love their children by raising them up in the nurture and admonition of the Lord, be sober, good, discreet, chaste, and keepers at home. There is nothing in this list about them teaching other women. The Lord has given older women this responsibility. Older women in the Bible are described in 1 Timothy 5:10, “Well reported of for good works; if she have brought up children, if she have lodged strangers, if she have washed the saints’ feet, if she have relieved the afflicted, if she have diligently followed every good work.” Then younger women who have lost their husbands are told to “bear children, guide the house, give none occasion to the adversary to speak reproachfully” (1 Timothy 5:14). I don’t see that the younger women are to teach other women in this verse either. Why is God’s perfect plan to have the older women teaching the younger women? (I have heard many say that “older” means older “spiritually” in Titus 2:3 but this isn’t what God meant. In the KJV, He calls them the “aged” women; those who have aged – older in age.) He wants the older women who have the time, wisdom, and experience to teach the younger women who are busy at home taking care of their families. Older women have raised children to adulthood. They know what works and doesn’t work in teaching children how to be obedient, hard workers, and mother children through the teenage years. They know what it is like to be married to the same man for many years. They have many years of being a keeper at home. They have learned to be modest, discreet, sober, and good since they have most likely walked with the Lord for a long time. Many of these younger women who blog, even those who aren’t teaching Titus 2:4, 5, write books and leave their homes for book signings and conferences. I just finished writing a book. This book took hours, days, and many months to finish, plus a lot of money. I couldn’t imagine trying to do this and write for a blog while raising children let alone travel, do conferences, and all that they do. I am sure it is the husband who is neglected in all of this. The older women, who have time on their hands now that their children are raised, need to fill in the gap. This is why I was drawn to Debi Pearl and Nancy Campbell years ago. They are older, time-tested women of God. They have walked with Him for many years, raised godly children, and are still in love with the husbands of their youths. I wanted to be like them, so I read everything they write. I learned from older, godly women with a lot of experience. If you are a younger woman with a yearning to blog and teach other women, I encourage you to wait until your children are grown up and out of the home. It takes a lot of time and mental thought to write and blog, then moderate your comments, and mentor those who email you. If you have a friend that you see struggling in her marriage, of course, meet with her for coffee and share the truths of what you know. Be a light to all those around you, but spend the precious little time you have with your children to do what the Lord has called you to do. Love your family and care for them. Do this think that Michelle Duggar is wrong to be giving speeches, writing books etc since she still has many young children at home? I’m not sure about this as she has raised several of her children but she is still spending much of her time not with her children and in her home. I am not going to be the one to judge anyone in particular, Emily, since I have no idea how much time they are taking away from being with their family to teach other women. Only they know this but I have written what I believe the Lord meant when the Apostle Paul wrote these words. In saying this, I don’t believe Michelle spends much time away from her family at all. She isn’t on Facebook, doesn’t have a blog, or on any of those other things that can be time wasters if not used wisely. She does have grown children, has a lot of wisdom and experience, and has been married a long time, but I imagine most of her time is spent with her family. I agree with you! I have a blog, but have stopped writing. I do have a FB page for the blog, however I pop in and write short hellos or share posts from other older Titus 2 women. I am I guess aged, 52 and I have older married children, but I still have a 17 and 12 year old home. I decided this time is too precious, it goes by so incredibly fast! Three older children ages 34-21 are out and married. I have grands:-) I have seen many younger women use the verse about if a person has something wise or useful they should share it. I can’t remember the verse right now:-( However, I think many young women are suffering in their homes. I just read a heart-wrenching account of a very prominent teacher who is very young and her marriage is destroyed. She wrote a book and toured and spoke at conferences. Her husband left her and the children. I really couldn’t believe it, but she shared her routine and she was on social media and blogging non stop throughout the day. She did homeschool, but sent the kids to Christian school, now I don’t know why, but how can you have time to teach if you are caught up teaching those outside your home so much? I feel it is a slippery slope for young women to take. I agree, Suzanne, and I believe this is why the Apostle Paul made it clear that it should be the aged women who have raised their children. There is a lot more free time once the children are out of the home. I am glad I didn’t even have this option while my children were under the roof. They were my priority, along with my husband and home. I agree with you on this! I’m thankful to have found your blog a few years ago because most blogs out there are from younger women. I’ve been following another younger Christian blogger for a while and was saddened to hear her husband left. I think there are many young women trying to reach other women but in the end it strains their marriage which should be their priority and the children suffer. When women are too busy, it is usually their husband who is the most neglected which should be their priority. Pray for this Christian blogger and her marriage. Hopefully, her husband will come home to her. I hate to hear of any marriages falling apart. This reminds me of the midwifery situation. After so many older midwives were eliminated in the past century, the newer generation of midwives tends to be younger women – but midwifery (constantly being on call, constantly being away from home) is a huge strain on young mothers with children. It’s really meant for older women who are done with child-rearing and have the time for it. And it is the same with blogging and mentoring. The points you make are spot on. While we’re raising our children, we need to be raising our children!!! After we’re done, then we can mentor and share our wisdom. But when we’re in the midst of the journey, blogging and teaching and mentoring can be incredibly destructive to a family, especially when it means spending oodles of time on the internet. I agree with you on this one, Lori, and I find it irritating when young “whippersnapperettes” pretend to teach that which they know precious little about. Nothing beats experience. I greatly appreciate the older women in my life, like my mother, my mother-in-law and other older women both at church and in my neighborhood. I think live “Titus 2 women” are the best. This online mentoring can be useful, but it doesn’t effectively take the place of the relationship that I think Paul had in mind when he gave that bit of instruction. I checked USPS and it says it’s $13.50 for shipping to send it to Norway so I will sell you a book for $20 total. I don’t charge the same price for those far away due to the cost of shipping for them. Lori! I have done it. May GOD bless and keep you! I agree with scripture on this but it’s important to not be legalistic and rigid at the same time. I have seen wonderful missionary families and women ministering to prisoners and God breathed works that Younger women are engaged in. Not at the **long term** expense of little ones however. but maybe the Lord needs to send a woman somewhere for two weeks for an important work and her husband and her decide it’s the right thing to do. My husband and I were *just* talking about this subject, and he is on board with me writing books (though very slowly) and blog posts, but I can see when I’ve allowed it to take over too much in the past. It is definitely wiser to not embark on something like that unless you have the strictest discipline and boundaries for yourself ahead of time and are aware of the pitfalls of blogging publicly. You also made a great point about handling moderating comments! I think because I didn’t have enough maturity, I thought I needed to publish every single comment (or argue with commenters), or respond to the women whose sole goal in life was to nit pick my blog LOL, when in reality I found out from Pastors’ and their wives’ experience that publishing the slandering comments is not beneficial to anyone. And not every comment needs to be answered either! Now that our oldest has started 1st grade, I’m amazed at how busy I’ve gotten with just handling everything at home. But I am glad that my husband and I have this blog together, it’s become a place where if he wants to write something it’s open for him to do so as well – and he’s actually been interested in doing that for a few years, but his career comes first and so he probably won’t be able to write much. But it’s a nice place to keep our thoughts especially for our children as they grow up. I really do think God puts different tasks on people based on only what He knows they’re capable of. Writing books, albeit fairly slowly, was actually an unwelcome task He’s put on my head, I never thought I would write a book – at least not before 40! So having God specifically put that in my heart and mind at 29, felt odd. But in following His will for me to write this first book and series, the blessings have been so immense and actually changed our lives in drastic ways! It is so deep and so profound, what He’s shown me through deeply researching this topic and seeking His wisdom from it – it’s hard to even explain that in words! But we have no doubt that God willed this for me, and my husband encourages me all the time to get with it and finish writing it. I’m so glad to have his unyielding support… when I haven’t been writing and been escaping God, I’ve actually felt like I’ve been sinning in a way, giving in to the circumstances of discouragement surrounding all the police officer deaths, etc. (there’s been close to 80 deaths since July). Even today I served at a funeral for one of our own officers in our city :'( . All these senseless deaths have made it so hard to find purpose in writing, but then during my quiet time, God will seriously pile on the pressure through different passages and verses and give me **undeniable** encouragement that I **need** to resume and finish writing. I’ve been amazed at how forceful He’s been in my quiet time in reminding me of this task I have, and the verses that have popped off the page are extremely convicting. Sorry this is so long, just wanted to say we totally agree with you – that if a young woman doesn’t have the capacity for strict discipline and boundaries about how long she’s online/how often she checks/moderates comments, how she handles responding to normal sinners or even evil people who taunt or criticize her work, how she handles betrayal in the blogging world, etc. then she’s probably not mature enough and sometimes that only comes with age and time. Thanks Lori~ another thought provoking post! Yes, nasty comments just take away from the post and besides, I am a teaching blog, not an arguing blog! 🙂 Blessings.